The Waterfall model is a traditional software development model introduced in 1970. In Waterfall methodology, development is seen as flowing staidly downwards (like waterfall) through various phases like requirement analysis, design, implementation, testing, integration and maintenance. Project is divided into sequential phases, with some overlap and splash back acceptable between phases. Tight control is maintained over the life of the project, using extensive written documents, as well as through formal reviews and approvals/sign-offs by the users occurring at the end of every phase (before beginning the next phase). Using workshops or focus groups to gather requirements. Prototyping and user testing of designs. Following a schedule that defers design improvements to the next product version. Keeping review meetings and other team communications informal. Rational Unified Process is a comprehensive process framework that provides industry-tested practices for softwares and systems delivery and implementation and for effective project management. RUP promotes iterative development and organizes the development of softwares and systems into four phases, i.e. Inception, Elaboration, Construction and Transition; each consisting of one or more executable iteration(s) of the software at that stage of development. This phase is also known as the feasibility study. It is completed on Client’s site/business unit/end users. EBSolute’s consultants investigate the given problem and the need for future process automation. Deliverables of this phase are Specific Recommendations for the proposed system, Project Plan, Budget and Proposed ROI. 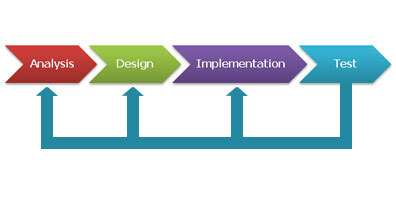 In this phase, we design the system based on the requirements analysis. Deliverables of this phase are System Architecture, Database Design and Specification (in some cases pseudo code). Typically, this phase is executed on-site. Based on the signed-off Design and Specification, our programmers write code and perform Unit Testing. Typically, this phase is performed at EBSolute’s off-shore centre. Once the development is completed, the entire system is tested. In this phase, end-to-end testing is done for all the functionalities and performance. During this phase, additional testing like Load and Integration Testing is also done (depending upon the requirements). In this phase, the final version of tested software is migrated to the production environment.